Marino Franchitti had expected to be at Le Mans this weekend, watching and supporting his cousin, Paul di Resta, in the F3 Euro Series. di Resta is currently leading the championship and fighting for the title. But he received a 'phone call this morning, asking him if he could get to Venice later today, to replace an otherwise occupied Chris Niarchos, in the #63 Scuderia Ecosse Ferrari, at Adria his weekend. The Scot is "absolutely over the moon, thrilled to be co-driving with Tim Mullen again - as well as being back with my home based team, Scuderia Ecosse." He's now packing his bags in order to get to Paris, to fly to Venice later today! Last time out he was second in class at Petit Le Mans: what next on the Marino Franchitti merry-go-round? 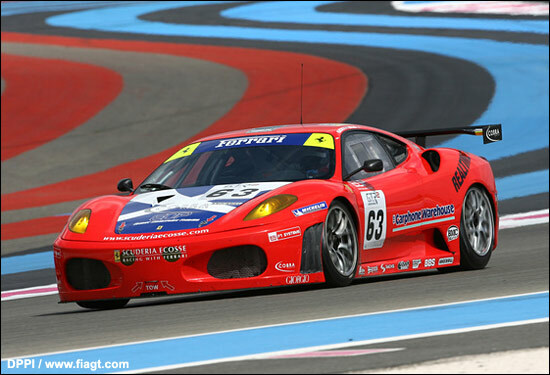 Here he is at Paul Ricard in August, where Mullen / Franchitti finished second in GT2, one second behind the #62 Scuderia Ecosse 430.